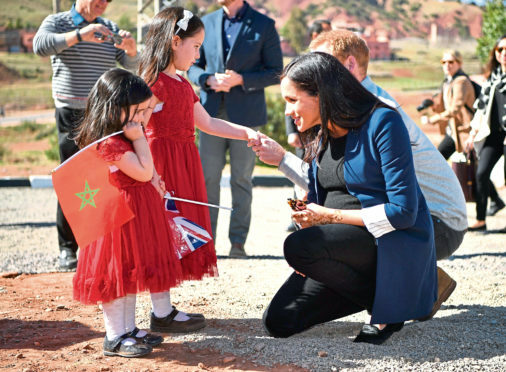 The Duke and Duchess of Sussex talk to two girls the henna design on her hand after a visit to the 'Education For All' boarding house in Asni Town, Atlas Mountains on the second day of her tour of Morocco with the Duke of Sussex. The accent of the British royals has changed somewhat over the years. In bygone days, the monarch’s accent wandered around Europe, the Scandinavian tones of the 11th Century giving way to centuries of French accents, then the Scots brogue of the Stewarts followed by the German utterings of the Hanoverians. Not forgetting William III’s Dutch twang. As the 20th Century progressed, though, we became used to the royal family speaking with cut-glass accents, as epitomised by our ever-so-well-spoken Queen. She has her own set ideas on pronunciation, famously insisting that the word “ma’am” – which she must hear more than most – should rhyme with “jam” not “marmalade”. The Duchess of Sussex added a new accent to “The Firm” but some are becoming convinced that Meghan is losing her Californian drawl and adopting, instead, a more plummy British accent. “There does seem to be something in the idea that Meghan’s speech has changed a bit, at least in some settings,” says phonetics specialist Dr Geoff Lindsey. Marisa Brook, professor in linguistics at the University of Toronto, says: “The Duchess has developed a style that sounds very English-aristocratic for interacting with the public. “I think a lot of it is deliberate on her part. She’s developed a style to be used when directly talking with the British public. “These are the situations where people might be judging her in public instantly, where it really benefits her to sound British and aristocratic. “I don’t think it makes her manipulative or a poser or anything. She’s someone who’s very offbeat from those who usually join the royal family so it makes a lot of sense – it’s not that she’s changing who she is. “It’s like she’s changing how she dresses, it’s like an extremely fancy outfit. Phonetics professor Jane Setter explains that speaking to crowds makes a difference because of what’s called “accommodation”, which is when people adapt their speech to the people they’re talking to. She says: “We all do this to some extent, speak differently with different people. “Someone with lots at stake in trying to ‘fit in’ or sound like they belong to a new in-group – British royalty in the case of Meghan – might find accommodation happens quite naturally and quickly. The Duchess’s acting background might have a bearing, as the professor adds: “Any potential acting coaching will make her more aware of the differences, and potentially better at mimicking them.